It has been a while since I have blogged but in fairness I have been ridiculously busy with birthday and wedding cakes. I am pleased to say I have become so popular that I am turning work away as I simply cannot fit another cake in! I have, however, discovered the magical art of jam making! I have been making chutney for a few years, much to my son’s disgust! He cannot abide the smell of it cooking! If truth be told, I was always a bit frightened of having a go at jam making. It brought back disturbing memories of standing on a chair stirring my grandmother’s gooseberry jam which was that tough you couldn’t get a spoon into the jar! I plucked up some courage, however, and decided to give it a go. Rather than waste money on lots of expensive fruit (in case I ruined it) I bought 800g of strawberries, raspberries, blackberries and blueberries from the bargain bin of my local supermarket. Yes, they might not be the prettiest of fruit or value for money if I wanted to keep them in a fridge for a week but they were ideal for my purpose. Let’s face it, they were going to be cut up, mashed and boiled they didn’t need to be pretty. The first time I tried this I bought special preserving sugar and it worked beautifully but that sugar can be quite expensive so I switched to regular granulated sugar and powdered pectin. It works just as well and at a fraction of the price. 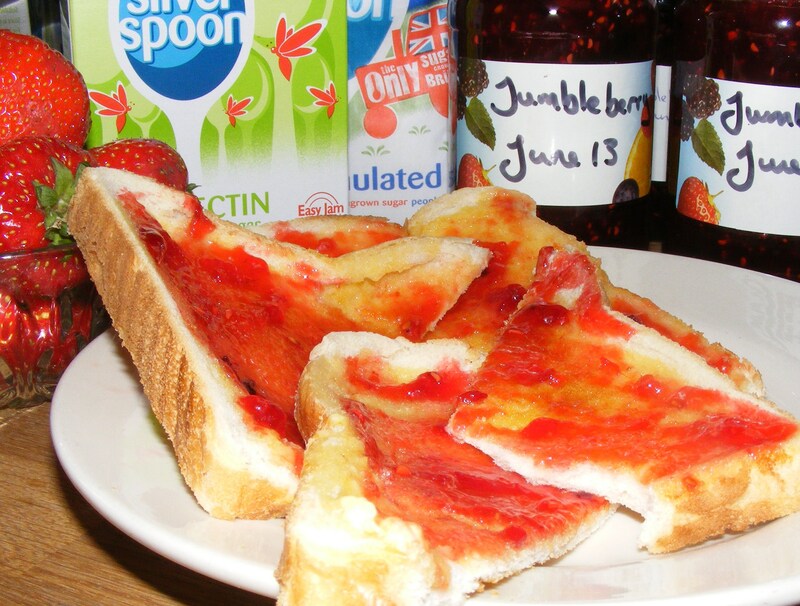 Jumbleberry jam is, quite literally, a jumble of different soft fruits. The jam is naturally scarlet in colour and tastes just like the jam you get in jam doughnuts! Mmmm! This recipe is idiot proof so be brave and have a go! Sterilise your jam jars and lids. I did mine in the dishwasher but boiling water or heating in the oven works just as well. By doing it in the dishwasher I can time the cycle finishing with when the jam is ready. Prepare the fruit by removing any cores and slicing the larger fruit. Mash the fruit or blitz in a food processor for a few minutes. The more you mash them the less lumpy your jam will be. Add the fruit to a large saucepan, add the sugar and pectin. Heat gently, stirring constantly until the sugar has dissolved. Slowly increase the heat, stirring constantly. Once the jam reaches a rolling boil i.e. when the volume rises and the bubbles dont disappear when you stir the jam, start timing for exactly FOUR MINUTES. Immediately remove from the heat and ladle into hot jam jars. Seal immediately and allow to cool and set. The jam will keep a good 6-9 months in a sealed jam. made freezer jam for the first time today…so easy!